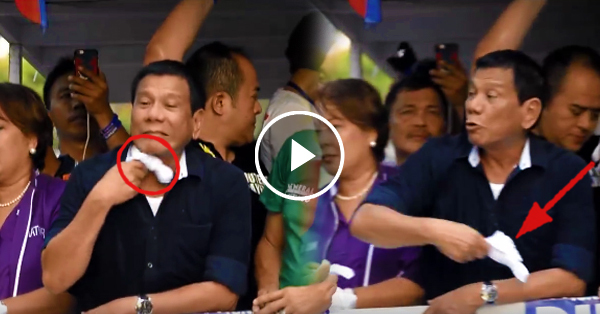 Mayor Duterte's controversial face towel throwing made the rounds online! Must Watch! Home / News / Mayor Duterte's controversial face towel throwing made the rounds online! Must Watch! Duterte is the leading presidential candidate now. He is topping the surveys from different survey firms. He has been dominating the online community as well. Now, a footage of Mayor Duterte as he was throwing away towels to the fans and supporters. But before he threw away the towels, he was using it to wipe his face. Many people claims that he might he been imitating the feast of the Black Nazarene. It is the event where the devotees are throwing towels to the image of the Black Nazarene thinking that it would be miraculous. But some people criticized what he did saying that he is not Jesus Christ nor a saint to do that act. While others defended him by saying that the Mayor did not intend to offend others.